These 2 man to man set plays below are from Wes Kosel’s Ultimate Horns Playbook. If these sets do not fit your players, I hope you can at least get an idea from them that might fit your needs. 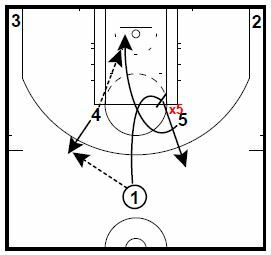 1 passes to 4 then cuts off of 5 into the lane and out to the right wing. 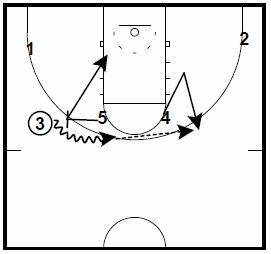 2 moves across the baseline as 3 steps in to the low post. 5 screens for 3 who cuts up and around 4 for a hand-off. 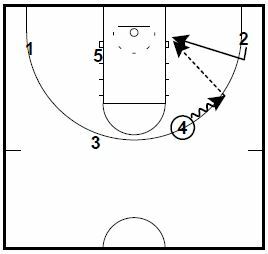 3 looks to shoot (Or drive) after getting the ball from 4. 5 pops out from the elbow and gets a pass from 1. 1 loops around 5 looking for the hand-off. 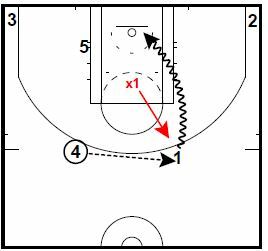 If the hand-off isn’t open, 1 continues down to the corner to screen for 3. 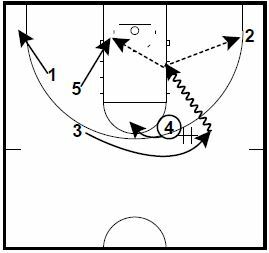 3 curls around the screen to the basket. 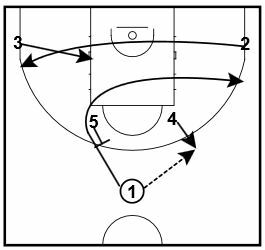 5 looks to pass to 3. If 3 isn’t open, he clears out to the corner. 5 dribbles toward the opposite elbow as 4 screens down for 2. 2 cuts off of the screen from 4 and takes the ball from 5 on a dribble hand-off. The screen combined with the hand-off serves as a staggered screen. 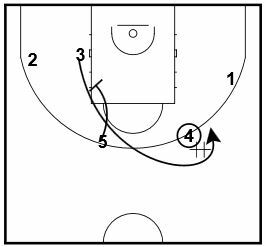 5 rolls to the basket as 2 drives into the lane. Here are two quick hitters from Iowa State’s Fred Hoiberg. They are both contained in the Basketball HoopScoop’s Fred Hoiberg Iowa State Cyclones Playbook (written by Wes Kosel). These plays are a part of this week’s featured eBook bundle along with Scott Peterman’s Ultimate Matchup Zone Defense Playbook. 1 dribbles to the left wing and gives the ball to 3 on a dribble hand-off. 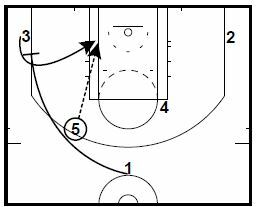 Once 3 has the ball, 5 sets a wing ball-screen for 3. 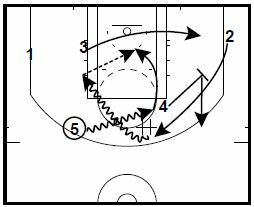 3 drives middle as 5 rolls to the basket. 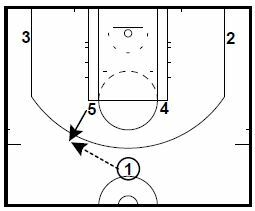 4 moves down as if setting a screen for 2, but instead pops out to get the pass from 3. 4 dribbles towards 2 as if he is going to execute a dribble hand-off. 2 makes a hard cut to the basket looking for the back-door pass from 4. 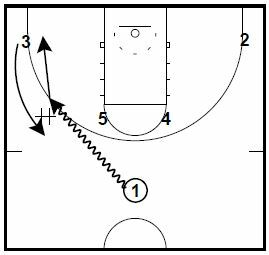 1 runs past 5 to set a staggered screen with 5 for 3. 3 cuts up the wing. 4 passes to 3 for a shot. If 3 doesn’t have a shot, 3 runs around 4 and gets the ball on a dribble hand-off. 3 turns the corner and drives to the basket looking to score, pass to 5 diving to the basket, or pass to 2 in the corner for a 3-point shot. This play is a part of this week’s featured eBook bundle along with Scott Peterman’s Ultimate Matchup Zone Defense Playbook. Vonn has been the Associate Head Coach for the Women’s program at Syracuse since 2011 as was instrumental in their final four run in the spring of 2016. 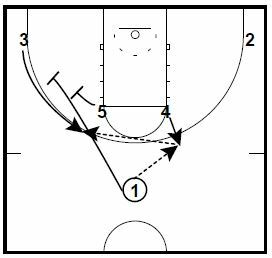 This play is a quick hitter to get an isolation for your 1 player. The numbers are meant to identify the players. They are not meant to say that you have to have a traditional #1 to run this play, or that the player has to drive to their right hand. You can adjust the play to the opposite side of the floor, if you would want the player to drive left. It is meant to stimulate your thinking to come up with ways to put your players in positions where they can use their individual strengths for the good of the team.